Esports are booming. At both a college and professional level, opportunities are popping up around the world for jobs and recreation. Newzoo, which provides esports analytics, projects the global market to surpass $1.6 billion by 2021. Esports teams are also growing in value; Cloud9, a North American team, is the highest valued in world at $310 million, according to Forbes. Tournaments and championships are gaining viewers on TV too — enough to challenge major sports leagues such as the NFL. According to a report from Riot Games, the developers of “League of Legends” (a multiplayer game centered around arena battles), the game’s championship in November reached nearly 100 million viewers. In comparison, Super Bowl LII between the Patriots and the Eagles drew 103.4 million viewers. Esports are finding success in high schools too, with colleges beginning to recruit students and offer scholarships. And Country Day is no exception. In February, history teacher Bill Crabb conceived the idea for an esports club. “A colleague of mine was talking about an esports club at a high school in Seattle that he’s working (at),” Crabb said. Crabb’s colleague said the club grew and became very successful. “It (gave) me the idea — I wonder if our kids would be interested in this as well,” Crabb said. When Crabb mentioned the idea to a few students, “it caught on,” he said. “All of a sudden, I had kids I don’t even teach knocking on my door,” he said. The club began as a “grassroots” movement, Crabb said, that quickly grew into the club it is today. The club is open to both middle and high schoolers, although only high school students may compete in the league. The club has 69 members (40 high schoolers). Most of them are boys, Crabb said. According to Crabb, the league consists of hundreds to thousands of teams. There are various prizes for winning teams. One sponsor, Micro-Star International (MSI), a computer hardware company, added $174,000 in equipment, including a full set of peripherals (MSI mouse, keyboard and headset) for players on top-placing teams. Schools partnered with the High School Esports League also receive discounts on MSI hardware and a full warranty on products. On top of teams receiving prizes, college recruiters are watching. The top 16 players in each game are connected with collegiate esports recruiters. One student from O’Dea Catholic High School (the one in Seattle) was offered a scholarship to a school in Texas. 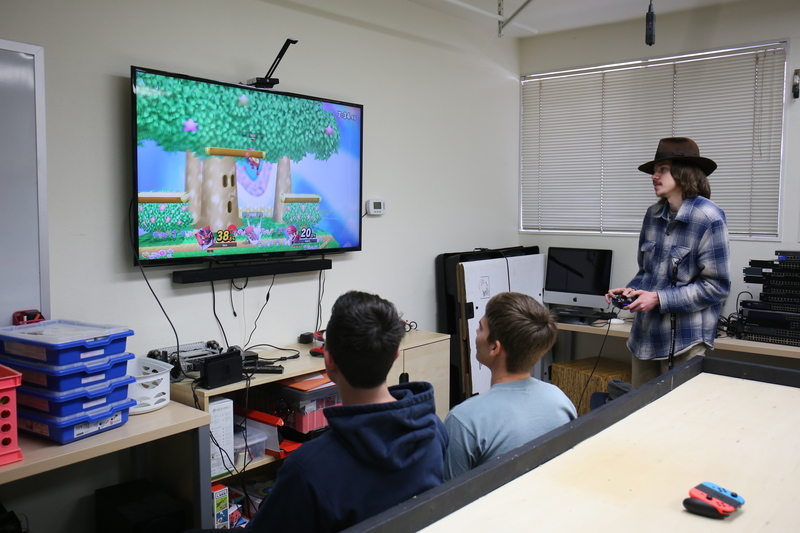 Crabb said the most popular games in the club are “Overwatch” and “Super Smash Brothers Ultimate,” both of which are used in the league. Sophomore Elise Sommerhaug said it was her brother, senior Eivind Sommerhaug, who wanted to start the club. Eivind Sommerhaug, who began playing video games with his sister in 2006 when the Nintendo Wii was released, said he enjoys video games’ complexity. Players can always improve, he added. Thus, he worked to get the club off the ground because he said he enjoys helping others improve at one of his passions. “It didn’t take too much work to get the club going because of how awesome and inspired our members are,” he said. All Eivind Sommerhaug needed to do was start a Discord server (an online messaging server often used by gamers) and get an administrative team for the club. Elise Sommerhaug said the best part of bringing esports to Country Day is how they connect people. That sense of community, for Crabb, is the biggest benefit of the esports club. “There’s a disconnect in many ways, (since) you’re playing with random people,” he said. Crabb added that SCDS esports bring students together. Esports give students who don’t play sports or do art a chance to shine. One club member is junior Darius Shabazi, who started playing video games when he was 7 or 8. According to Shabazi, a big goal of esports is for players to test their skills. “You can assume you’re good (at a) game, but you can’t really know until you play against others on a competitive level,” Shabazi said. Country Day’s club, Omega Clan, plans to compete in the High School Esports League beginning this month. Games began March 18. Crabb said the club has already begun scrimmaging against O’Dea Catholic. Crabb said parents are the biggest obstacle. Crabb said the name “esports” can also be controversial, as there isn’t much physical activity involved. But Crabb said the benefits of the club outweigh the costs. And the school has shown support as well. Guidelines were set, though. Head of school Lee Thomsen said school administrators wanted the club to have organization and a plan. “The club started and got momentum before (head of high school Brooke Wells, director of technology Shelley Hinson, Crabb and myself) had had a chance to think about what parameters should be put around it,” Thomsen said. To reassure administrators, Eivind Sommerhaug created practice times and divided players into groups based on times they were free to practice. A schedule was set up to ensure students knew when they could practice. “Like any sport, there are limits to how often you can practice, and there needs to be structure with esports as well,” Wells said. Thomsen said one issue with the club was the lack of an adult in the Makerspace. “What brought (the club) to our attention in the first place was the question of supervision of kids who were playing or practicing in the Makerspace,” Thomsen said. “We want to make sure the club has an articulated purpose and mission,” Thomsen said. Senior Joe Mo, an administrator for the club’s Discord server, said he wasn’t surprised when there was some resistance to the club. Mo agreed with Thomsen that there is often confusion about what esports really means. “Part of the club is trying to explain to people what our goals are, what esports really are and how (they) could be an interesting addition to the campus,” Mo said. Mo said he hopes the club keeps expanding and suggested video editing, compiling and posting highlights and writing guides and reviews of games as possibilities. Both Wells and Thomsen said they haven’t heard direct feedback about the club from parents or faculty, although Thomsen has noticed a few faculty members who have expressed confusion over what the club is doing. But ultimately, Thomsen and Wells said the club is valuable for the school — especially since it could attract prospective students. “(The club) might be a differentiator for us as a high school to draw kids interested (in esports),” Thomsen said. Wells recognized esports’ rapid growth.